Some hockey fans have been clamoring for the state hockey tournament to return to the days of one-class hockey, when the "little guys" had a chance to knock off the big suburban powers. Those days aren't returning any time soon, so pull up a chair for the next best thing. In the regular season finale Saturday night in Mendota Heights, the top-ranked team in Class 2A (Hill-Murray) faces the top-ranked team in Class 1A (St. Thomas Academy). Let's ignore the fact that both play in the same conference (the oft-maligned Classic Suburban) and both are east-side private schools. This one has the chance to be one of the best regular season games of the winter. 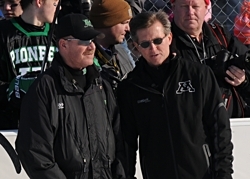 Hill-Murray coach Bill Lechner and Moorhead coach Dave Morinville discuss ice conditions Saturday at Hockey Day Minnesota (Photo by Tim Kolehmainen). Hill-Murray (19-3-1) has shattered the idea that the No. 1 spot in the Class 2A polls is cursed by holding onto it for the last four weeks. The Pioneers, after losing two of three to begin the season, are on a 12-game winning streak that included a 4-3 victory over St. Thomas Academy on Jan. 27. Super sophomore Jake Guentzel (13-25-38) scored the game-winner with 1:13 remaining, while Bobby Bruski (14-17-31) had his breakout with a pair of goals. Hill-Murray was actually outshot 31-28, but senior goaltender Tim Shaughnessy (16-3-1, 1.56, .913) came up big with 28 saves. Shaughnessy is just one of a number of veteran leaders on the Pioneers, as he's in his third year of starting. That group includes Mr. Hockey finalist Ben Bahe (24-22-46), the team's leading scorer who just notched the game-winner in a slush-fest at Moorhead in last Saturday's Hockey Day Minnesota, and rugged defenseman J.D. Cotroneo. But the Pioneers also have terrific young players, including Guentzel and fellow sophomore Zach LaValle (18-18-36), who tweaked his ankle on the ice in Moorhead, but should be back shortly. St. Thomas Academy's Zach Schroeder leads the team in scoring with 46 points in 22 games (Photo by Tim Kolehmainen). St. Thomas Academy (17-5-0) hasn't lost to any other Minnesota high school program since the turn of the year -- outside of that one-goal loss to Hill-Murray. The Cadets are 13-2-0 since Jan. 1st (the other loss was 6-4 to Shattuck-St. Mary's on Jan. 18) and have won seven in a row, scoring 54 goals in that span. The Cadets' offense is balanced, with nine players in double-digit points and five with at least six goals. Matt Kroska (22-18-40), A.J. Reid (18-25-43) and Zach Schroeder (19-27-46) are the main offensive weapons, although defensemen Taylor Fleming (6-24-30) and Eric Schurhamer (8-16-24) add plenty of potency from the point. While St. Thomas Academy can certainly put the puck in the net, it's the emergence of sophomore goaltender David Zevnik (11-3-0, 2.05, .903) that has the Cadets dreaming of a state title. The graduation of three-year starter Kurt Altrichter left them without an experienced veteran, but Zevnik has stepped up big. 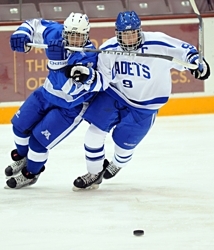 Zach Schroeder of St. Thomas Academy attempts to stuff a puck past Minnetonka's Alex Glockner (Photo by Tim Kolehmainen). The season finale could cement a changing of the guard in the Tri-Metro and Section 2A pecking order, as Blake seeks to complete its unbeaten run through the conference -- a place Breck has enjoyed while winning the last two Class A state titles. Blake has a veteran team that has not lost to a Class A opponent all season (its only two losses were to Holy Angels and Minnetonka) and beat the Mustangs 4-2 on Jan. 27. Goaltender Ryan Hayes (10-2-2, 2.29, .900) was on his game that night, making 29 saves on 31 shots as Breck held a 31-24 shots advantage. Breck graduated a big senior class last spring, but is getting contributions from its veterans such as Conor Anderle, Grant Opperman and Wesley Iverson, who have combined for 66 goals. This game is a war. And I don't say that lightly. The two close Iron Range rivals truly don't like each other, and with perenially powerful teams, it makes for some terrific, hard-hitting hockey. That was evident in the first meeting on Jan. 15, which Hibbing claimed 4-3 behind three-point nights from Nick DeCenzo (21-47-68), Adam Johnson (34-35-69) and Mike Pechnovnik. The game was tied 1-1 entering the third before a scoring flurry that ended with Pechnovnik's game-winner with 29 seconds left. While Hibbing's top line of DeCenzo, Johnson and Joe Anderson (16-28-44) has been very potent, so has the Blue Devils' first unit led by Mr. Hockey finalist Garrett Hendrickson (26-43-69). Talk about a tight conference race. Entering the final week of the regular season, the top four teams in the Lake Conference are separated by just two points. Minnetonka is in the lead with nine points, but has struggled over the past week with an 0-2-1 mark (losing to Bloomington Jefferson and Edina and tying Eden Prairie). Wayzata is in fourth place with seven points, but a well-played week could vault them into the lead. For that to happen, it will likely come on the shoulders of the top line of Tony Cameranesi, Mario Lucia and Tyler Klein, who have combined for 51 goals and 123 points. 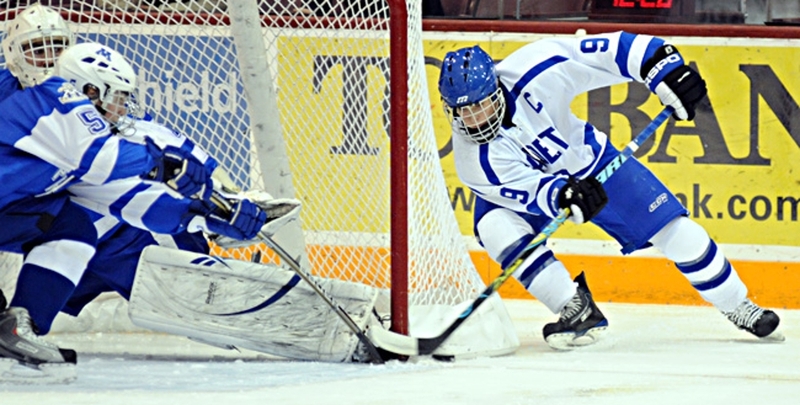 Minnetonka took the first meeting between the two teams, a surprising 6-0 shutout on Jan. 29. Let's stay in the west Metro again. Here ere are the two teams tied for second place in the Lake Conference between circuit-leading Minnetonka and fourth-place Wayzata in a game that very well could decide the conference champion. Edina appears to have recovered from its January swoon, with a 5-1-0 record in the last three weeks (three by shutout). But the Hornets must deal with the loss of Mr. Hockey finalist Max Everson, who broke his wrist in the final minute of a victory over Minnetonka. Everson will try to play in the section playoffs, but he'll be missed against Eden Prairie's powerful offense, led by its own Mr. Hockey finalist in Kyle Rau (29-34-63). Edina has yet another Mr. Hockey finalist in Steven Fogarty (18-17-35). Could Bloomington Jefferson be peaking at just the right time? The forgotten Jaguars have won their past three games by a combined 20-2 margin (including an impressive 4-2 victory over Minnetonka) and are poised to make some noise in the Section 2AA playoffs. We'll get a good feel for their chances this Thursday, when they face South Suburban Conference leading Burnsville -- who incidentally, also will be one of the top seeds in 2AA. The Blaze already have a leg up on Jefferson courtesy of a 5-3 victory on Feb. 3. In that game, the Jaguars actually outshot Burnsville 32-27, but ran into goaltender Bodhi Engum (16-4-2, 2.50, .900), who has the skills to carry the Blaze on his shoulders. What's the saying? Blood is thicker than water? Coaching cousins Erik Aus (Centennial) and Dave Aus (Blaine) will test that theory in the battle between Northwest Suburban Conference -- and Section 5AA -- rivals. Blaine, the five-time defending section champions, took a hit the last time the two teams met (a 5-0 Centennial victory on Jan. 15). That was part of a great turnaround for the Cougars, who are 8-2-1 over the past 11 games after beginning with just two victories in their first 11 games. Blaine is on a five-game winning streak and is sneaky good. The Bengals aren't getting much respect, but perhaps that's just how they want it. Jonny Brodzinski (25-24-49) is a true goal-scoring sniper. Most experts have been tabbing the trio of East Grand Forks, Thief River Falls and defending champion Warroad as the favorite in Section 8A this winter. But another team from the far north (Lake of the Woods) with arguably the best goalie in the state (Alex Lyon) might just have something to say about it. The Bears are unbeaten in their last 11 games (9-0-2) and lost a narrow 1-0 decision to Warroad in their first meeting back on Dec. 7. That's the way the Bears have played this year -- tight, low-scoring games with Lyon (15-5-3, 1.44, .949) anchoring the squad. Lake of the Woods isn't a powerhouse offensive team, as it averages just 3.74 per game. Bryson Jasper is the top goal scorer with 17. The Southwest Conference's two unbeaten teams couldn't decide an outcome the first time they met (a 2-2 tie on Jan. 21), which leaves the rematch to decide the circuit's title between Morris/Benson Area and Marshall, each of whom is 10-0-1 in conference play. It will likely come down to which team can impose it's will on the other. Morris/Benson Area is a high-scoring unit (5.55 goals per game), led by sniper Tyler Hansen (33 goals). He's one of six Storm with double-digit goals on the season. Meanwhile, Marshall has a stout defense (2.05 goals per game), backstopped by the goaltending tandem of Andrew Noble (9-4-3, 1.93, .912) and Zach McCoy (5-1-0, 1.89, .897). Detroit Lakes may have already wrapped up the Mid-State Conference title, as the Lakers hold a three-point advantage over Northern Lakes and Park Rapids Area with just one conference game remaining, but that doesn't mean this heated rivalry will produce a game any less intense. The past two years, their games have been one-goal thrillers, including a 6-5 Lakers' overtime victory on Dec. 14 in which they overcame a 4-1 second-period deficit. Both teams have big-time scoring threats, with Park Rapids boasting of Sam Coborn (35-27-62) and Detroit Lakes leaning on Nate Baker (41-24-65). It should be another high-scoring, interesting game Tuesday night.